2D and 3D printers have one thing in common: gripes about their cost of materials. Every time you have to run to the store to buy new printer cartridges or place an order for a new supply of 3D printer material, you are reminded of the cost. It’s an ongoing source of aggravation. Both are expensive. But there is little you can do if you want to keep the 2D/3D printer humming along. There is a big difference, though. 2D cartridges don’t have hidden costs that drive up the real cost of materials. Let me give you an example, one that won’t result in slings and arrows coming my way since the company is no longer in business. Solido had a lamination technology that glued and cut sheets of low-cost PVC plastic. PVC sold for the low, low price of $21.80 per pound ($1.63 per cubic inch), which made this one of the lowest cost 3D printer materials. When you add in all the waste material—imaging a 6.3-inch by 8.3-inch block surrounding the printed part— the real cost ballooned to an average price of $25.00 per cubic inch in a 2011 benchmark I conducted. What was one of the lowest cost raw materials became the highest net material cost. Support material—can be much more than you think. Recycling rates—you may not be able to reuse everything that comes out of the 3D printer. Vat life—continuous exposure changes properties, making it unusable. Secondary materials—epoxies and adhesives aren’t cheap. By no means do I want to dissuade you from using 3D printers. The reason that I bring up the real cost of materials is so that you can prepare those that control the budget. Without the proper expectations, you may find that a budget review has management questioning your “excessive” use of the 3D printer. Don’t laugh. I’ve seen it happen many times. And nothing is sadder than seeing a mostly idle 3D printer governed by monthly allowances for materials. Even though this is definitely a “penny wise and pound foolish” scenario, it happens all the time. Management can see and measure the cost of materials. It appears on the purchasing reports, departmental budget reports and profit/loss (P&L) statements. This makes it real and actionable. What is less obvious, less tangible, and therefore less real, is the value of the extra prototype that prevents a costly design mistake. 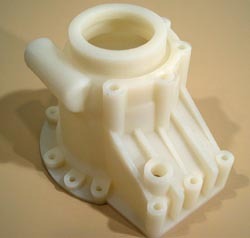 To keep your 3D printer churning out parts, work both sides of the P&L. Build the business case for prototyping by documenting and demonstrating the value (ROI) with every project. And make the decision makers aware of the total cost of operation so that there aren’t any surprises. So, the moral of this story is to do some diligence to uncover the real cost of materials. Once in hand, advise your management of the anticipated expense. If they know what to expect, they are less likely to limit the number of parts that come out of your 3D printer.